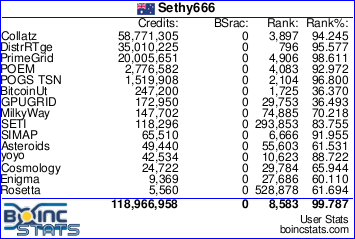 We need to find a way to get us more members running boinc another 100 members would be great and we would start flying by alot more teams. Just an observation; BOINC has a lot of projects, most of which have different goals and aims. The best way of getting more BOINC members is deciding the Project of the Month (don't know whether you've started that yet? ), then promoting the goal of that project. With so many different options, people are split over what exactly they're working towards. With a single project to focus on, it would be a lot easier to get word out. There's also both project and team (other team) challenges that people/we could contribute towards. I would love to help out but Im heavily into folding ATM and all my free PC time is used for that. I think thats what makes boinc so good you can do your faviorte project but you will still be helping your team overclock.net. While that's true, I think first of all you need to raise awareness. Use the Project of the Month as a platform to get new members into BOINC, then give them the information to spread to other projects. RIP Syrillian - "Semper fidelis"
But at least your contributing . Gluten-free huh? You have Celiac, or is it for some other reason?